This course is one of the top new designations in real estate and is taught nationally by the Real Estate Negotiation Institute. 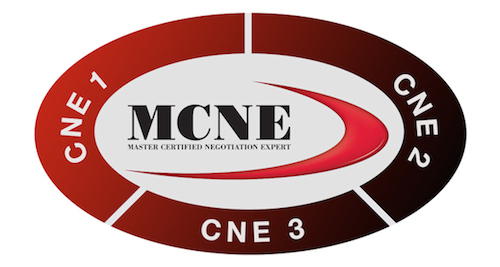 Complete all three CNE courses in any order to earn your MCNE Designation! This class is part of the new premier negotiation program in real estate, the “Master Certified Negotiation Expert (MCNE®)” designation from the Real Estate Negotiation Institute. Additional information on the MCNE® designation program can be found at www.thereni.com. After successfully completing the MCNE® program, you can advertise to clients that you are truly among the best trained negotiators in real estate! Then use your negotiation skills in other areas of your life too! Classes routinely sell out! If you wait too long, you’ll miss out on all the success the MCNE can bring you and your clients.